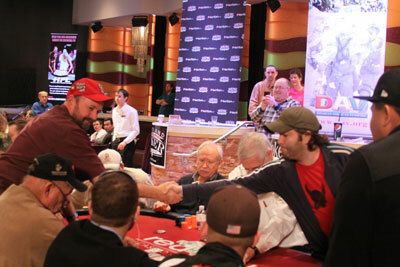 Congratulations to Andrew Downing (pictured in red had) who became the newest Free Poker Network Texas Champion. Andrew along with 18 other players came together on January 31st at 3rd Base Bar in Arlington to decide which player would be heading to Las Vegas at the end of April. By winning Andrew won himself airfare and hotel on the Vegas strip and while in Las Vegas, Andrew will join 24 other players from around the country to compete in the Free Poker Network National Championship at Caesar's Palace at the end of April. In all $12,000 worth of buy-ins will be distributed to the 25 players with first place being a $5,000 World Series of Poker circuit event at Caesar's Palace. 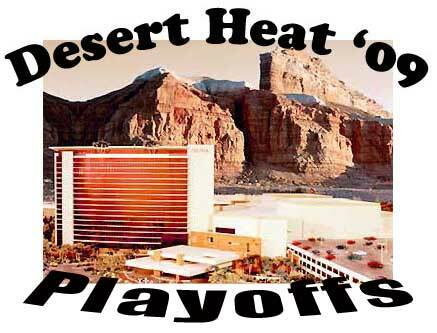 Kyle Coker the summer's Desert Heat promotion winner had a very memorable experience while in Las Vegas. Kyle got to rub elbows with some of today's biggest poker superstars during the Heartland Poker Tour's VIP party. Not only did Kyle get the chance to meet Dennis Phillips who made the final table in the 2008 WSOP main event and he also made a very deep run again in 2009, but Kyle knocked Dennis out of the tournament! The FPN staff had a great time meeting Kyle and wishes him the best of luck in upcoming promotions as he represented the league well. John Dipalma from the Gameday Bar and Grill in Mansfield, Texas took down the tenth and final $3500 WPT cruise package while outlasting 18 other players during the championship tournament held on our FNP online site on Sunday, February 22nd. John got off to a slow start, but started catching some hands to build himself up to one of the chip leaders. Once he got the chip lead he was able to maintain it through the rest of the tournament. John was running well too as he was able to get quads twice! Once the tournament was over John was really excited as he said, "I'm going swimming!" Click read more for the full story and blog. On Wednesday night, September 16th, Texas held its Desert Heat Championship at the Firehouse Grill in Mansfield Texas. Twenty-four players had qualified and the final three left standing were Brenda Morefield, Daryl Barrett, and Kyle Coker. When the dust settled Kyle Coker was named champion with Daryl placing second, and respectivly Brenda came in third. Brenda and Daryl have both qualified for a state championship before and this was Kyle's first time to qualify. Kyle did not start the day with a double chip stack. Way to go Kyle and we will see you at the Red Rock Casino in Sunny Las Vegas! On Sunday February 22nd at 7:00 EST, 8 players from GameDay Bar and Grill will take their shot at the 10th and final grand prize package for the Ship It! promotion. Hank Smetak, John Dipalma, Justin Champman, David Brown, Trent Johnson, Anthony Horton, Gene Gregorio, and former Texas champion Tina McNabb will all face off against 11 other players from around the country to win a 7-day cruise package for two on-board the Norwegian Spirit.